It’s true. It just is. I haven’t been bitten by the off road bug (and choose not to pay for a second bike)…until now. This trail makes me want to buy a fat tire, learn to ride it, and move to Utah! The Rush soundtrack brought back fond memories of high school, too. Thanks Fatty. Here’s a link to his post with the video. So how was your lunch yesterday? As much as I am stuck being a mediocre endurance athlete (not that I’m complaining…just stating I’m neither fast nor strong) I often find it hard to just go out easy and enjoy the scenery. If my mind wanders, I tend to speed up, push harder, and usually not notice until I’m in the redzone. So today my minor victory was just making the whole ride easy. I stayed in zone 2 except for a few brief forays in z3 and never pushed into zone 4, geared way down on hills, and generally took in the sights. It was really great to be outside on the bike again. The trainer is a great way to maintain winter fitness but it doesn’t do much for the soul. (In fact, due to recent improvements to the “distraction center”, I’m sure it actively rots my brain.) It was a wholly satisfying ride, especially after my wholly unsatisfying ride two days ago. Yay me for going slow. My life is so hard. What could be more pleasant to look forward to on a fine spring’s Friday evening at the end of the workweek than a chance to get out on the bike? Especially the first outside ride in two months. Not much! Well, maybe a Friday evening’s ride before a two-week vacation? Anyway, suffice it to say I was looking forward to it. Unfortunately, it was not a great ride and left me in a surprisingly sour mood. It’s not often being active outside, especially on the bike, leaves me anything but refreshed and bright. It wasn’t anything I can point to; I didn’t even get honked at or flipped off. It just felt bad. Awkward. Alien. As real cyclists refer to bad rides or tired legs as “pedaling squares”, I was pedaling triangles or pentagons…whichever is worse. I felt so un-powerful that any effort at all was uncomfortable. Add that to a general feeling of wanting to get off the bike and I was at a loss to understand my problem, let alone fix it. So I soft-pedaled home and had dinner and a glass of red wine with my wife. Problem solved! My very good friend Nick loves riding his bike but hasn’t had any time (family, kids, owns his own home improvement business) and a knee injury doesn’t help either. On top of that there are the universal hassles of getting out on the bike (gear, weather, darkness, motivation) we all know and hate. He wished he could ride more. His wife Nikki got him a trainer in the hopes it would help him use his lovely Fuji-molded carbon-ness more. Unfortunately I kept forgetting to bring over an extra skewer that would fit the trainer. I finally remembered so, while there checking on the dogs while they were away, I swapped the skewer and put the bike on the trainer as a welcome home surprise. I got a a text from Nick the night they got home, and while I won’t go into details, it involved bikes, and trainers, and miles, and dress shoes and I could tell he was happy. Tonight I got an email from Nikki with this great picture attached. Of course Nick wouldn’t be satisfied with just riding his bike. Most of us need a distraction cycling indoors. Many of us choose tv or movies or videos of cycling workouts…some of us need more than that. Nick needs more hand-eye-coordination-challenging activities. 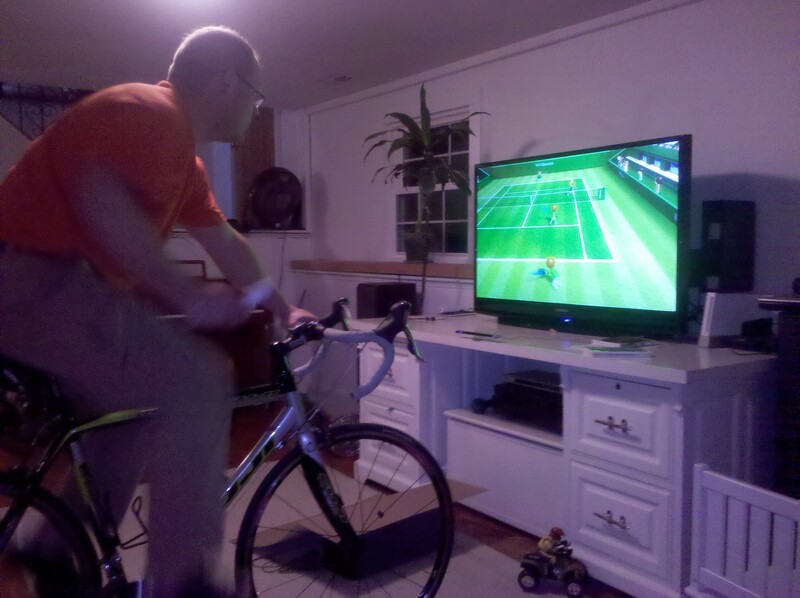 Coming to a fitness center near you: Wii tennis cycle trainer tournaments.